One thing about doing Whole30 in the middle of winter is that I tend to crave creamy soups. With this recipe, I can fulfill those cravings and still stay totally complaint with the eating plan. We love this one so much that we eat it all the time even when we aren’t doing Whole30. 1. Heat oil over medium heat in a medium saute pan. Add onion and cook for 3-4 minutes. Add garlic and cook for an additional minute. Transfer to bowl of slow cooker. 2. 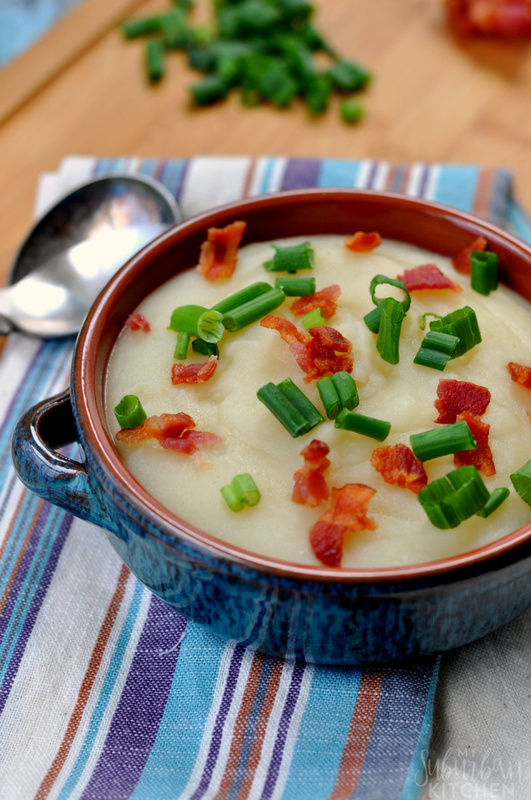 Quarter potatoes and add to slow cooker bowl. Add salt, pepper, nutritional yeast (if using), and vegetable broth. Stir well. 3. Cook on low for 4-5 hours. Once done, use potato masher to mash potatoes. Or for a smoother soup, use an immersion blender to blend until smooth. 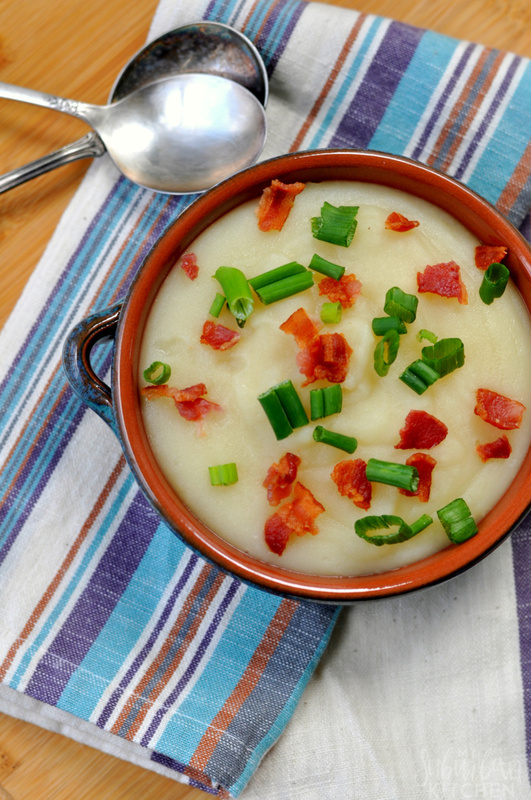 Serve topped with bacon pieces and green onion slices. I prefer my soup pretty smooth so I definitely go the immersion blender route. It takes just a few minutes to create a perfectly creamy soup that actually has no cream, milk or butter in it! If you like a chunkier texture, just use a potato masher and mash the potatoes to the consistency you want. What are your favorite soups for winter? Do you like trying to find healthier ways to make your favorite comfort foods? Heat oil over medium heat in a medium saute pan. Add onion and cook for 3-4 minutes. Add garlic and cook for an additional minute. Transfer to bowl of slow cooker. 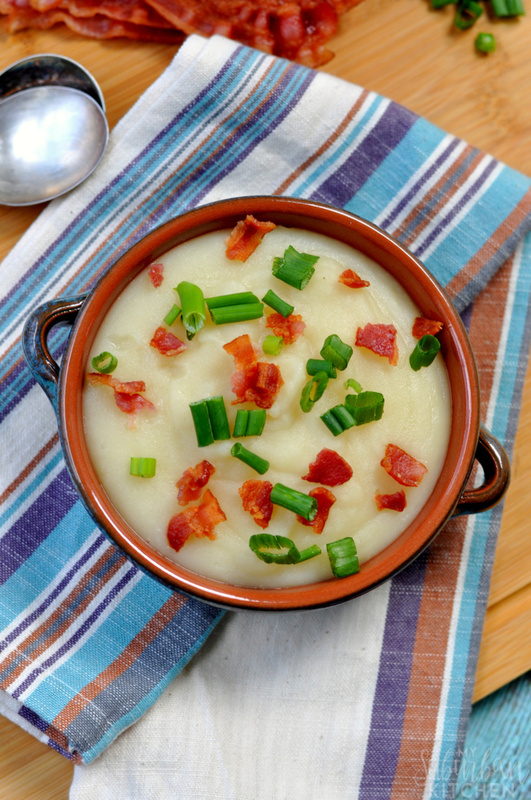 Quarter potatoes and add to slow cooker bowl. Add salt, pepper, nutritional yeast (if using), and vegetable broth. Stir well. Cook on low for 4-5 hours. Once done, use potato masher to mash potatoes. Or for a smoother soup, use an immersion blender to blend until smooth. 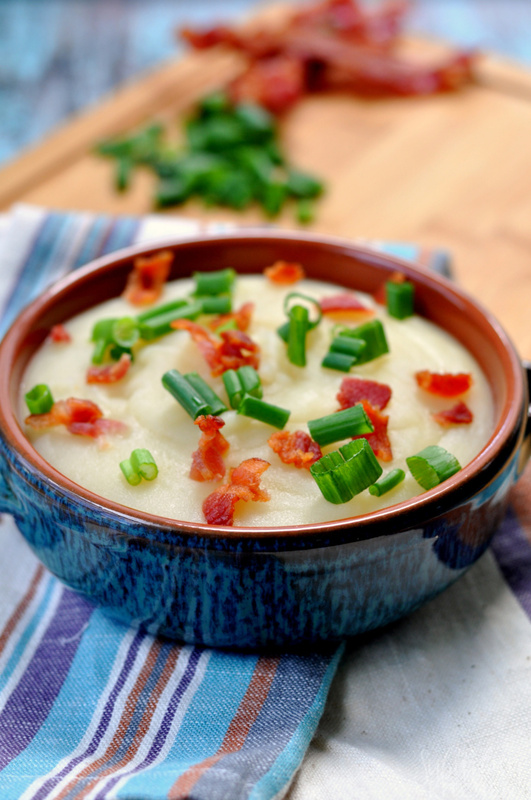 Serve topped with bacon pieces and green onion slices. Wow! I would never have thought you could make a paleo version of this! Looks yummy! Easy cook recipe like this for a busy person like me specially in the morning. I have never made a potato soup using nutritional yeast, it sounds intriguing and looks great.